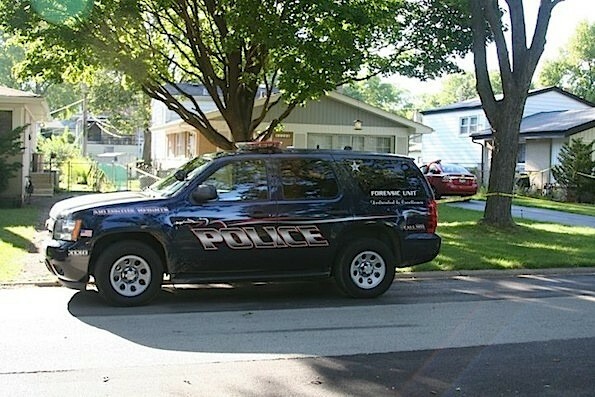 Arlington Heights police received a report about 4:20 PM Tuesday responded to a hold-up alarm in the 1200 block of South Walnut Avenue, just north of White Oak. Police received a report that a residential hold-up alarm was activated. When police arrived, they found an open door with dogs inside and waited for backup to enter the home. Police entered the home just after 4:30 p.m. after sizing up the residence, and found a female victim bleeding from the face, and then found a gun in the house. No word if anyone else was in the house. Many residents in the neighborhood were not aware of any gunshot fired, but saw a very rapid police response. Neighbors reported that the paramedics immediately transported the victim out of the house and left the scene. Firefighter/paramedics transported one victim with life-threatening injuries to Northwest Community Hospital. No word available whether the hold-up alarm was activated by another person, or the victim activated the alarm before being wounded by the weapon. Apparently there is no threat in the neighborhood, and police do not appear to be looking for a suspect in the neighborhood. Yellow crime tape was placed around the front yard of the house. An animal welfare officer cared for at least two dogs that were at the residence. Police activity involved a rapid response down Arlington Heights Road for the backup of police officers who discovered a gunshot victim at an unsecured house, and following a holdup alarm. A residential holdup alarm is intended for use by residents who discover an intruder in their home, or who are followed into their home by an intruder, and who are unable to use their voice to call 9-1-1. It is preferably not used for most other type of calls for police help. Two neighbors thought that an older man and his daughter lived in the house.